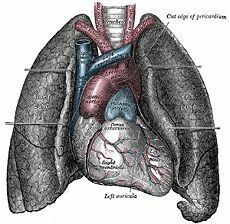 The heart and lungs, from an older edition of Gray's Anatomy. Organs, exemplified by such diverse components as brain, eyes, and liver, are one of several levels of organization in living organisms. A given organ is usually thought of as being a component of an organ system, a group of organs that work together to perform a set of related functions, such as the digestive system composed of the mouth, esophagus, intestines, and other organs. At a lower level of organization an organ is an aggregation of several tissues that interact to perform a specific function, such as the heart pumping blood or the stomach digesting food. In the case of the stomach, muscle tissue causes movement, epithelial tissue secretes enzymes, such as pepsin, and nervous tissue conducts messages back and forth between the stomach and brain (Towle 1989). A tissue, in turn, is an aggregation of interconnected, morphologically, and functionally similar cells, and associated intercellular matter, that together perform one or more specific functions within an organism. In a living organism, cells depend upon other cells, tissues depend upon other tissues, and organs depend upon other organs to perform their particular functions to keep the entire organism alive. Each cell, tissue, and organ demonstrates the principle of bi-level functionality: The entity not only performs actions for its own maintenance, self-preservation, and self-strengthening, but also performs specific actions that contribute to the larger entity (the tissue, organ, organ system, or body). The body, on the other hand, supports the individual cell, tissue, organ, and organ system by providing access to food, oxygen, and shelter, and by disposing of waste materials. Skin, the largest organ in the human body. 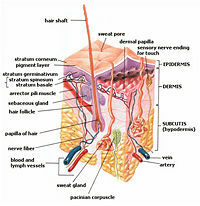 Cross-section of all skin layers. Common animal (including human) organs include the heart, lungs, brain, eye, stomach, spleen, bones, pancreas, thyroid, kidneys, liver, intestines, skin (the largest human organ), uterus, and bladder. Animal organs inside the body are often referred to as internal organs. The internal organs collectively are often called viscera, the plural of the rarely-used term viscus. Usually in an organ, there is a main tissue and sporadic tissues. The main tissue is the one that is unique for the specific organ. For example, main tissue in the heart is the myocardium, while sporadic tissues are the associated nervous, blood, and connective tissues. Not only animals, but also plants have tissues and organs, with three fundamental plant organs being the roots, stems, and leaves, and an example of tissue being vascular tissue and ground tissue. Plant organs can be divided into vegetative and reproductive. Vegetative plant organs are root, stem and leaf, while reproductive organs are flower, seed, and fruit. The vegetative organs are essential for maintaining the life of a plant (they do the vegetative, vital functions, like photosynthesis), while the reproductive are essential in the reproduction. But, if there is asexual vegetative reproduction, the vegetative organs are those that create the new generation of plants; therefore, usually creating a clonal colony. A group of related organs is an organ system. Organs within a system may be related in any number of ways, but relationships of function are most commonly used. For example, the urinary system comprises organs that work together to produce, store, and carry urine. The functions of organ systems often share significant overlap. For instance, the nervous and endocrine system both operate via a shared organ, the hypothalamus. For this reason, the two systems often are combined and studied as the neuroendocrine system. The same is true for the musculoskeletal system, which involves the relationship between the muscular and skeletal systems. There are typically considered to be eleven major organ systems of the human body. The harmonious and hierarchical bi-level functionality manifested throughout the levels of organization within the organism—from cells to tissues, organs, organ systems, and the whole organism—offers a model for relations and organization in human society and civilization. Ideally individuals would contribute to their families (as cells to tissues), their families to their communities and societies (as tissues to organs), their societies to their nations (as organs to organ systems), and their nations to the world (as organ systems to the body), and in turn each would be benefited by those larger entities. This page was last modified on 24 February 2015, at 20:07.